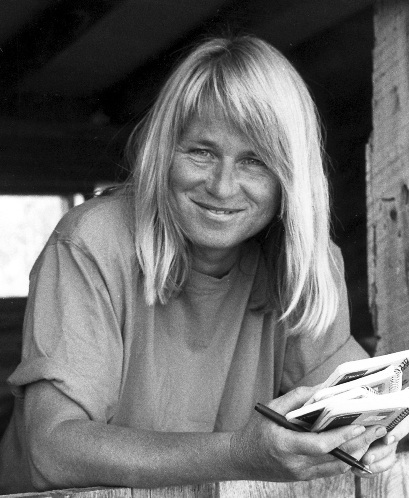 Gretel Ehrlich, a writer of nonfiction, fiction, and poetry, born in Santa Barbara, California, January 21, 1946, writes about such diverse places as Wyoming, China, and Greenland. Her unique point of view on humans and the environment has earned Ehrlich a place among the best nature writers of our time. The collection contains correspondence between Ehrlich and some of these important authors, including Barry Lopez, Ted Hoagland, William Kittredge, and Terry Tempest Williams. In addition to her writing, Ehrlich is also known for her work in film editing and producing, beginning with her studies in film at UCLA and culminating in several productions as well as a 1976 PBS grant, which led to a documentary about sheep herding in the Big Horn Mountains of Wyoming. The National Endowment for the Humanities has twice recognized the importance of Ehrlich’s work in both a creative writing fellowship award and a humanities grant. Besides her books and film work, Ehrlich has also published poems, screen plays, and numerous magazine articles. Ehrlich, Gretel. Facing the Wave: A Journey in the Wake of the Tsunami. NY: Pantheon, 2013. Ehrlich, Gretel. In the Empire of Ice: Encounters in a Changing Landscape. Washington, D.C.: National Geographic, 2010. Ehrlich, Gretel. Drinking Dry Clouds: Stories from Wyoming. Lincoln: University of Nebraska Press, 2005. Ehrlich, Gretel. The Future of Ice: A Journey into Cold. New York: Vintage, 2005. Ehrlich, Gretel. This Cold Heaven: Seven Seasons in Greenland. New York: Pantheon, 2001. Ehrlich, Gretel. John Muir: Nature’s Visionary. Washington, D.C.: National Geographic, 2000. Ehrlich, Gretel. Cowboy Island: Farewell to a Ranching Legacy, text by Ehrlich, edited by Nita Vail. Santa Barbara: Santa Cruz Island Foundation, 2000. Ehrlich, Gretel. The Horse Whisperer: An Illustrated Companion to the Major Motion Picture, photographs by Jay Dusard and others. New York: Dell, 1998. Ehrlich, Gretel. Questions of Heaven: The Chinese Journey of an American Buddhist. Boston: Beacon, 1997. Ehrlich, Gretel. A Match to the Heart: One Woman's Story of Being Struck by Lightning. New York: Pantheon, 1994. Ehrlich, Gretel. Yellowstone: Land of Fire & Ice, photographs by Willard and Kathy Clay. San Francisco: HarperCollins West, 1994. Ehrlich, Gretel. Arctic Heart: A Poem Cycle. Santa Barbara: Capra Press, 1992. Ehrlich, Gretel. Drinking Dry Clouds: Stories from Wyoming. Santa Barbara: Capra Press, 1991. Ehrlich, Gretel. Islands, the Universe, Home. New York: Viking, 1991. Ehrlich, Gretel. Heart Mountain. New York: Viking, 1988. Ehrlich, Gretel. Wyoming Stories. New York: Viking, 1986. Ehrlich, Gretel. The Solace of Open Spaces. New York: Viking, 1985. Ehrlich, Gretel. To Touch the Water. Boise: Ahsahta Press, 1981. Ehrlich, Gretel. Geode/Rock Body. Santa Barbara: Capricorn, 1970.